Jasper Moon, internationally renowned ‘seer to the stars’, had signally failed to foresee his own future. He is found dead on his consulting-room floor, his skull crushed with a crystal ball and, all, around him, his office in chaos. Meanwhile, Ma Rafferty does some star-gazing of her own and is sure she can predict Detective Inspector Joe Rafferty’s future – by the simple expedient of organizing it herself. She is still engaged on her crusade to get Rafferty married off to a good Catholic girl with child-bearing hips. But Rafferty has a cunning plan to sabotage her machinations. Only trouble is, he needs Sergeant Llewellyn’s cooperation and he isn’t sure he’s going to get it. During their murder investigations, Inspector Rafferty and Sergeant Llewellyn discover a highly incriminating video concealed in Moon’s flat, a video which, if made public, could wreck more than one life. Was the famous astrologer really a vicious sexual predator? Gradually, connections begin to emerge between Moon and others in the small Essex town of Elmhurst. But how is Rafferty to solve the case when all of his suspects have seemingly unbreakable alibis? Really enjoyed this book. I just finished it a few minutes ago and I was so excited to post my review because this is now one of my favorite books. Definately one I will be reading again at some points. This one was an other book I couldn't put down. If you are into mystery books then I think you might like this one. 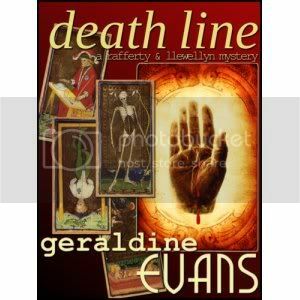 Here is Geraldine Evans website with the links to where you can buy Death Line or any of her other books.